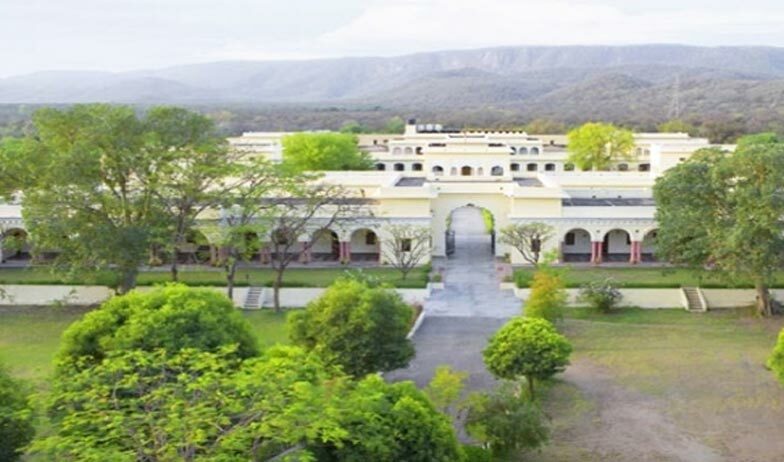 Sariska Palace was built by the Maharaja of Alwar as a royal hunting lodge just on the edge of the Sariska National Park. 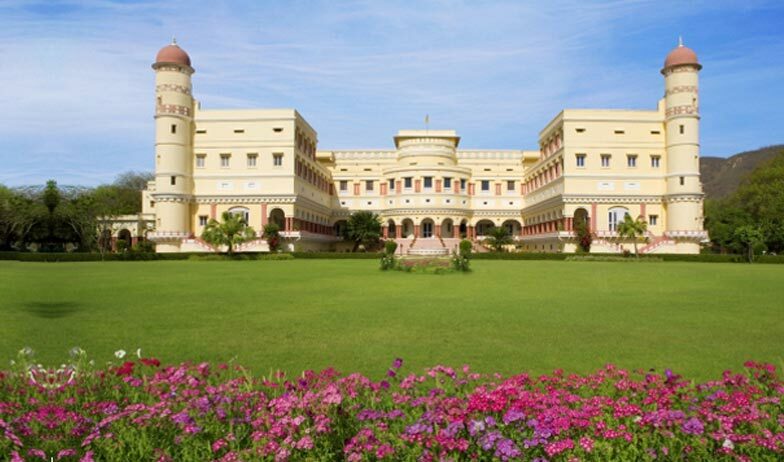 The architecture of the hotel is a blend of the regal Rajasthani and French theme. This resort is set amidst lush green surroundings in almost 120 acres of land. 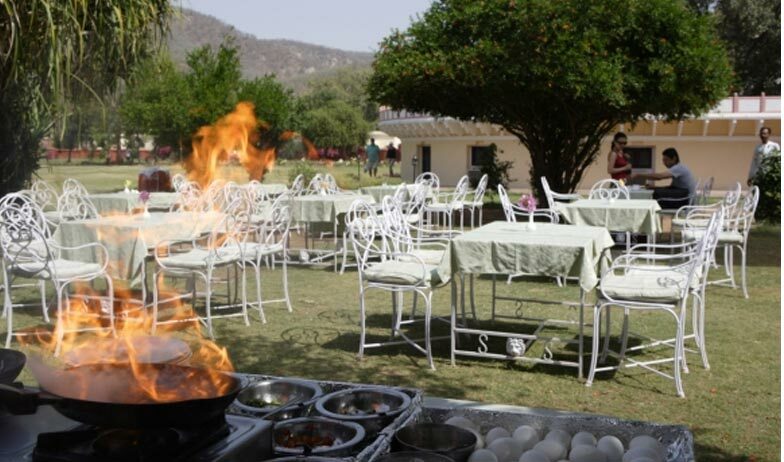 It offers an amalgamation of the royal splendor with the state of the art amenities, which ensure that the guests have a pleasant and luxurious time during their stay in Sariska. Some of the facilities that this resort boasts of include a clear water swimming pool, providing a range of accessories like the water tubes and more. The resort also has a spa that provides rejuvenating Jacuzzi, Sauna and Massage facilities to the esteemed guests. The guests can also enjoy jogging in and around the palace. The couples looking to celebrate their weddings privately yet in a grand style, can make the booking for the lawns at the Sariska Palace. These lawns are carpeted all around the palace and add to the glory of the Palace. Also available is clay Tennis Court where the guests can enjoy a swing of their tennis racquets. The accommodation offered by the Palace is simply marvelous and boats of luxury in every sense. Also, the multi-cuisine restaurant and the Bar at the Palace take care of all your needs for a delightful meal in serene surroundings. 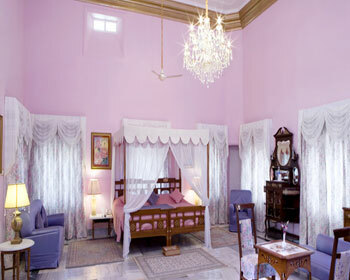 The Standard Rooms or the Haveli is simply an extension of the palace that was built for the Maharaja of Alwar. Each of these rooms is an epitome of luxury in true senses. 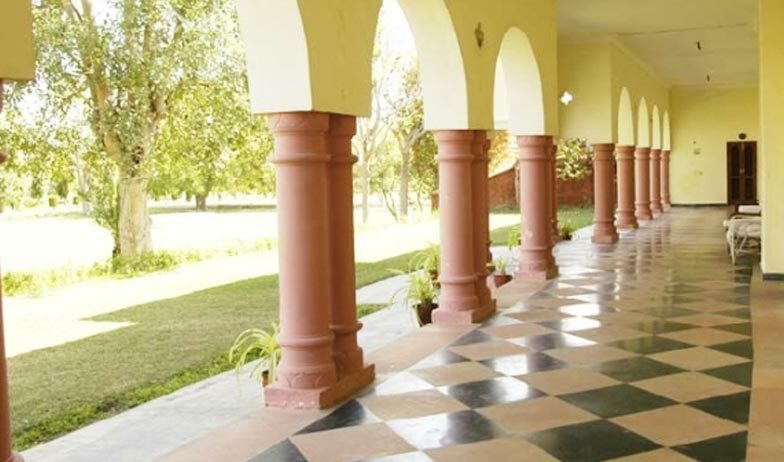 These air-conditioned rooms have wooden flooring and are fitted with the world class amenities to ensure that the guests have a pleasing time in Sariska. Some of the amenities that are available in these rooms include a double bed/ twin beds, color television that displays satellite channels, telephone facility with direct dial STD and ISD, round the clock room service, daily housekeeping, in room dining, attached bathroom with running supply of hot and cold water, branded toiletries and more. For the people who want to retain the memories of their lavish holiday in Sariska, the Maharaja Jai Singh Superior Suites are the most preferred options. These kinglike expanses are trimmed with modern day amenities to ensure that you live life like a king. 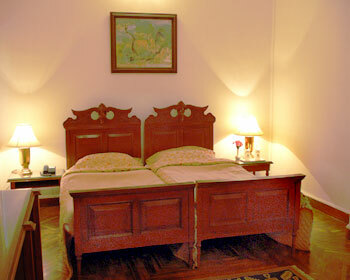 These are the renovated versions of the suites that were used by the Maharaja and the Maharani during their stay. They air-conditioned, fully carpeted rooms that have a king sized bed and several sofas and chairs along with a huge closet to hang your clothes. Each of these suites offers best of the amenities like a Mini Bar, Tea/ Coffee maker with complimentary sachets, large LCD TV with satellite channels, refrigerator, telephone facility with STD and ISD direct dial, safety deposit locker to keep your valuables, attached bathroom with four fixture fittings, bath tub, lavish toiletries and bath robe and slippers etc. 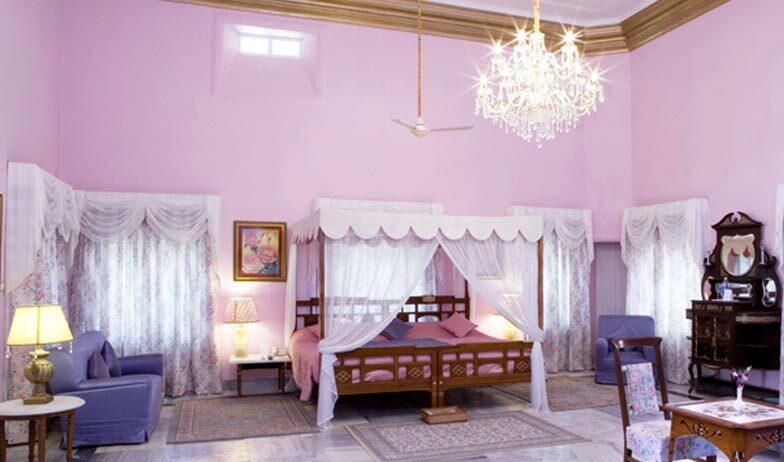 The Maharaja Jai Singh Suite at Sariska Palace offers sheer luxury and much more to the guests. 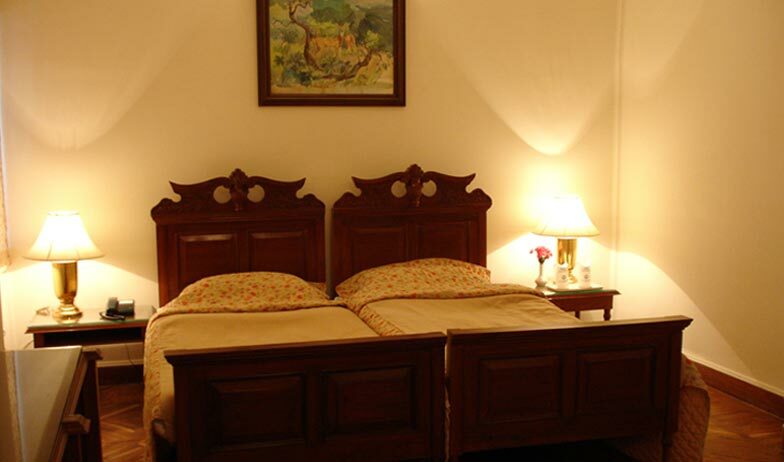 These suites are apt for those people who are looking to spend a quality time in Sariska along with their family and friends. Fully air-conditioned, well decorated Maharaja Jai Singh suites catch the fancy of all people due to their amazing design and color palette. Well-appointed suites in the traditional taste, these suites offer world class amenities to the guests and ensure that they have a gala time as long as they stay here. Some of the amenities that you can look forward to when you select to stay here include a king size bed, a large LCD TV with satellite channels, refrigerator, in room safety deposit locker, Mini Bar with selected beverages and snacks, Tea/ Coffee maker with complimentary sachets, round the clock room service, in room dining and daily housekeeping etc. The en suite bathroom supplies 24 hour hot and cold water and premium toiletries, bathrobes and slippers. There is a lavish bath tub in each bathroom. The Royal Chambers Superior Suites at Sariska Palace attract travelers who do not wish to compromise on their comfort and luxuries when travelling. These suites are well endowed with almost everything that comes on the luxury list. From the subtle color scheme on the walls to the warm décor to the traditional furniture and carpets, these rooms speak volumes about style and grandeur from the times of the Maharajas. The guests are entitled to enjoy amenities and facilities like a double bed; sofa sets with center table, study table with comfortable chair, closet to hang clothes and more. These air-conditioned suites are well carpeted and offer a large satellite LCD TV, direct dial telephone facility, Tea/Coffee maker, Mini Bar, in room locker, daily housekeeping, 24 hour room service and in room dining facility. There is availability of hot and cold water, premium branded toiletries and a lavish bathtub in the en suite bathroom. 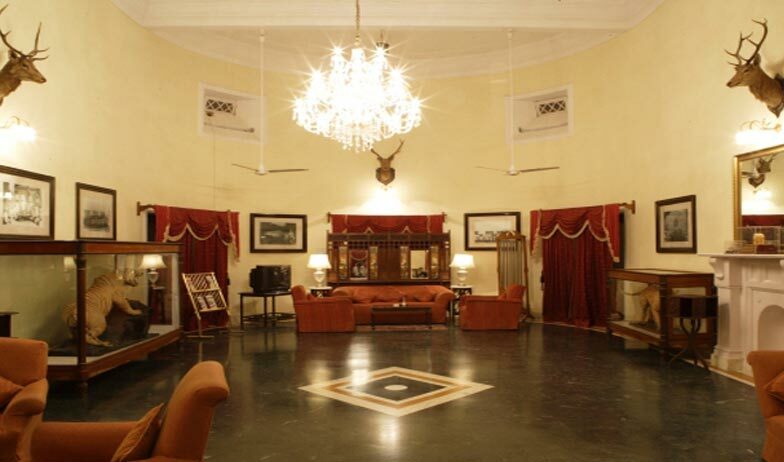 Royal Chambers Deluxe accommodations at Sariska Palace are apt for those travelers who are looking for comfort and lavishness without hurting their pocket. Enjoy life of the kings and queens when you decide to stay at these suites and that too at a reasonable price. Ranging from the traditional decorations to the world class amenities, these suites provide all possible comfort in the Palace. A double bed, a large LCD TV that displays all satellite channels, Tea/ Coffee maker, air-conditioner, safety locker, Mini Bar, round the clock room service, daily housekeeping, in room dining, attached bathroom, 24 hour hot and cold water supply are some of the amenities and facilities that you can look forward to when you select to stay in these suites. 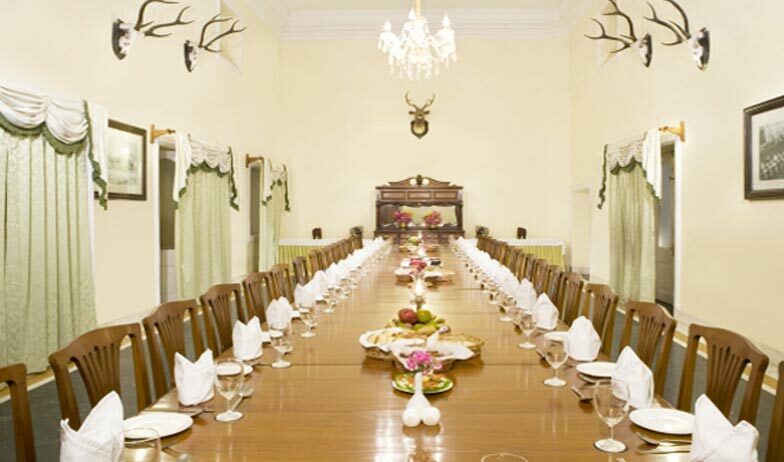 The magic of a Royal Feast can be experienced at the 80 seater multi-cuisine restaurant at Sariska Palace. The ambiance of the restaurant is truly magical. 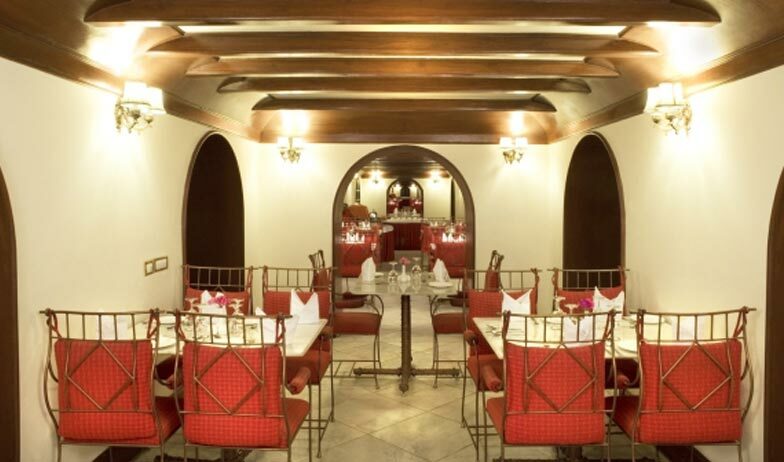 The majestic setting, the hospitality and the finger licking cuisines offer a divine experience to the diners. The chefs ensure that the food is prepared hygienically and only the best of ingredients are utilized to prepare the gastronomical delights from various parts of the world as well as the local delicacies. The staff of the hotel makes sure that you thoroughly enjoy your meals and serve you to the best of their capacity. Tired after a day-long visit to the jungle? Wish to relax your nerves away from the hustle and bustle of the city, then head straight to Cat’s Whiskers Bar at Sariska Palace. Ranging from domestic to Indian brands of wines, whiskeys, single malts, beer, cocktails and more, there is a wide variety of options available on the menu card. You can combine your favorite drinks with delectable finger food and light snacks to make a wonderful twosome. It is a perfect place to have informal meetings with your clients and other associates and also for a fun evening with your friends.